Custom built vanities feature function & beauty! 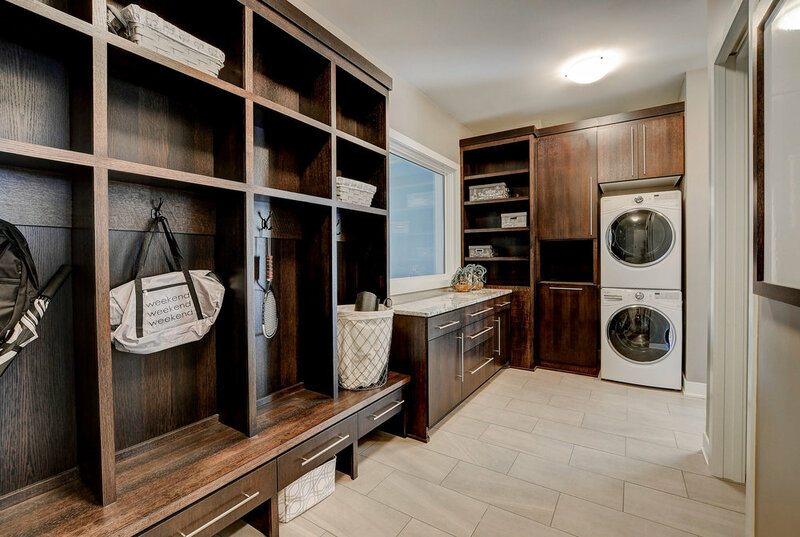 The lower open storage is the perfect place to display towels or other decor, while the center bench offer separation between spaces & a place to take a break! Solid surface counters showcase the stunning countertop mount sinks by DXV. Drawer space is functional while still giving the vanity area the “open - feel”. We always say - light fixtures are the jewelry of the home! They help in making your vision (or theme) come to life! 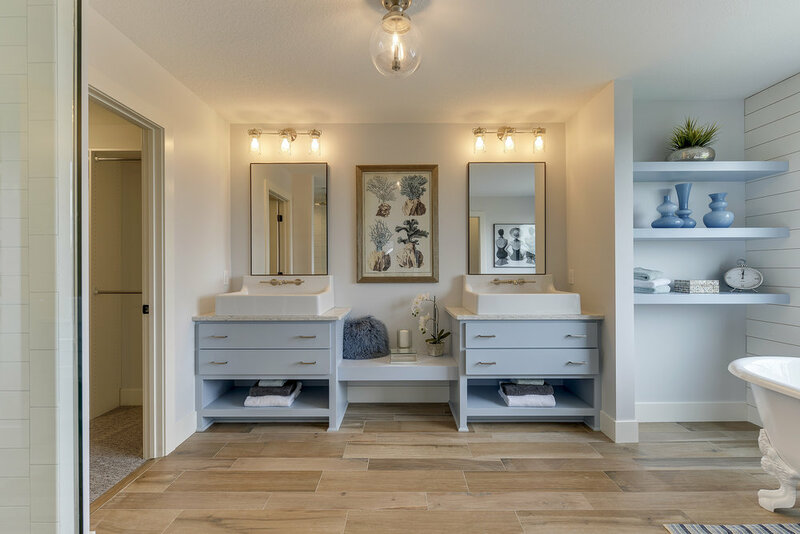 This bathroom features simple yet beautiful clear globe lights over the vanities & in the ceiling - giving it the Modern Farmhouse vibe our clients were looking for! Ok, time for the real showstopper - this TUB! This clawfoot tub by Kallista is easily one of the most eye catching features in this bathroom. With dramatic eagle-claw feet and furled edging, it truly is a piece of art! 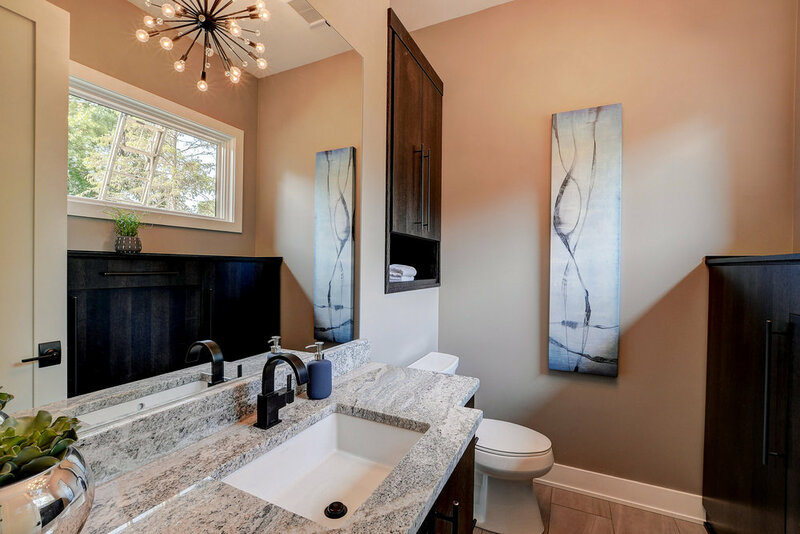 Paired with the modern Mirabelle tub faucet, it rings true to the style of this home. Enameled floating shelves are a great place to display decor! These wood-look plank tile floors are the perfect way to add warmth into this space while still being functional for a bathroom. The various widths & colors give you a rustic, comfortable feel. Who doesn’t love a classic white subway tile shower? It’s the perfect mix of traditional & modern! This shower features 2 shower heads - one mounted on the wall & one rain head - bringing you a spa-like experience! These homeowners’ opted for a shower ledge vs. a niche - which we think was a great choice! It’s a functional yet clean way to access all the things you’ll need in the shower. Framed with clear heavy glass, this shower is the perfect place to relax. What is your favorite part of this space? Our Fall 2018 Parade of Homes Model home was a showstopper. We’re so excited to share a closer look into one of our favorite spaces of the home - the Living Room! The built in floating cabinetry brings function and style. 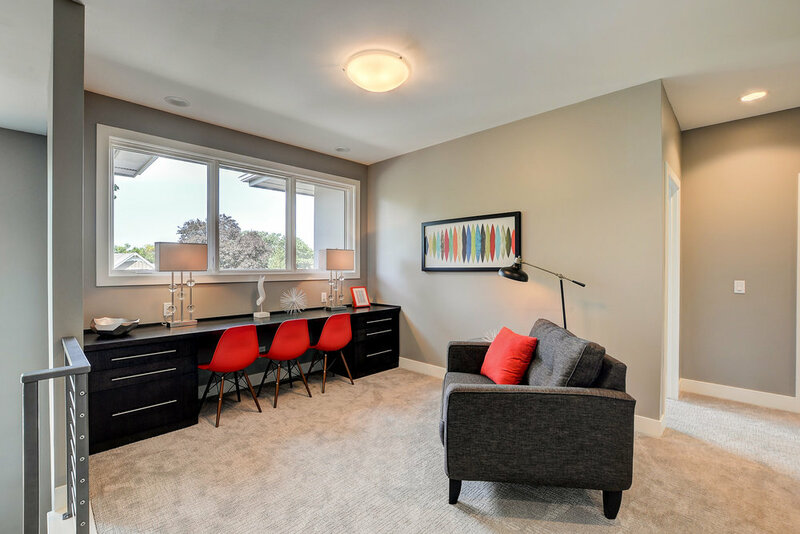 With soft close drawers & doors, wood top, and large hardware - this space is perfect for storing movies, blankets and more - while still creating a contemporary feel. These cabinets are a stained Rift Oak, and if we do say so ourselves, are gorgeous. The wood floors are a site-finish hardwood floor. They’re 5” wide and 3/4” thick White Oak with a custom stain. The stain is a warm grey/brown that ties in the neutral pallet of this home perfectly. Site finish hardwood floors are great because over time, if they scratch, you can get them refinished! This fireplace is truly the centerpiece of this room. 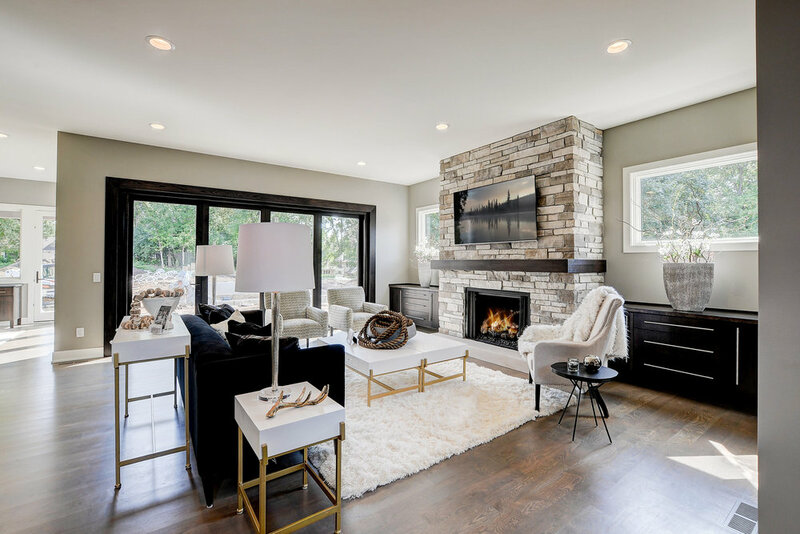 With stone going up to the ceiling, a raised limestone hearth, and cozy open flame gas fireplace unit. This is the perfect spot to cozy up next to in the cold winter months. 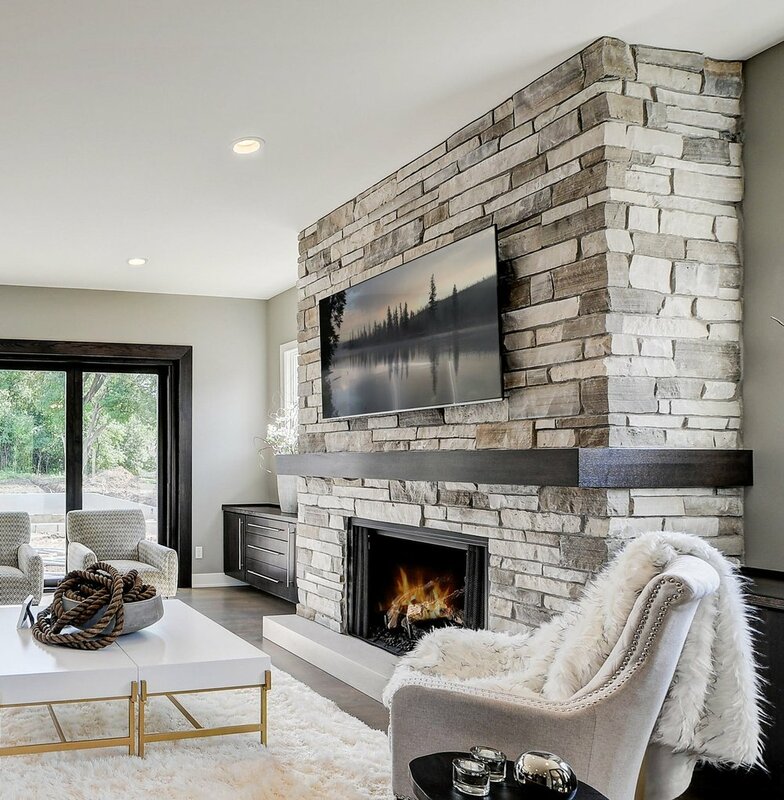 The custom made wrapped mantel adds a contemporary finish to a more traditional fireplace to tie the entire space together. This home sits on a large flat lot, that was perfect for a pool! With that pool, the homeowners decided they wanted to expand their entertaining space - so they could bring the outdoors in. The Centor folding door was the perfect fit to make this dream a reality! The large 4 panes of glass include a swing door, and can bi-fold on-top of one another to create an open wall! This door also features a window-covering system for privacy, as well as a complete screen that will cover the entire opening. Modern farmhouse style with an art deco twist! This spacious Kitchen offers plenty of light, a large island, and beautiful wainscoting on the walls. A large center island is the perfect place to enjoy appetizers & drinks with friends, or serve the kiddos a quick dinner. It's blue-gray color adds a "pop" without being too startling. Brass hardware is featured on the doors & drawers - did we mention that we love the storage along the backside of the island?! 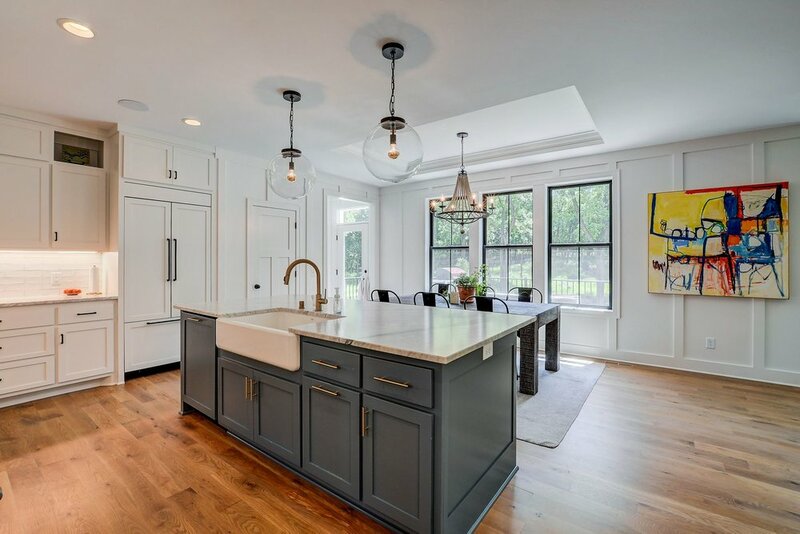 Large glass pendants give an industrial feel as they compliment the brass kitchen faucet. The farmhouse sink is tucked nicely under a stunning marble countertop, and is large enough for pots and pans! A large Jenn-Air stove is the centerpiece of this kitchen perimeter. 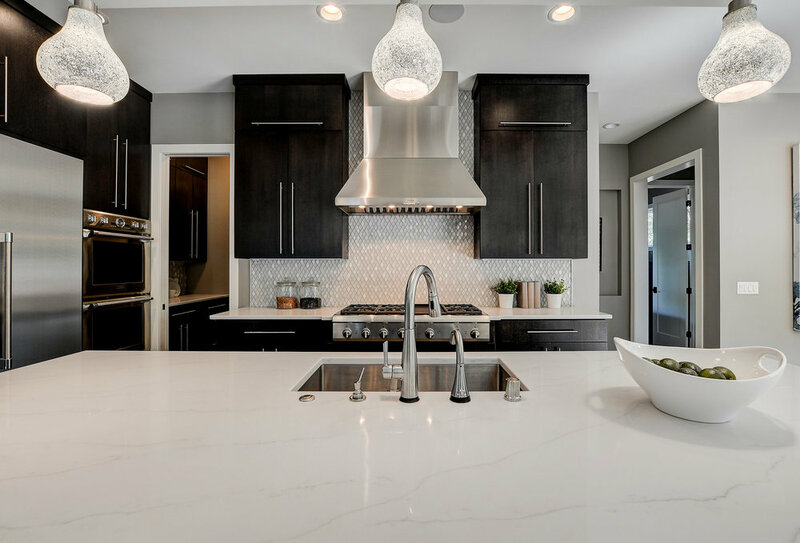 Whether you're a 5-star chef, or a home cook - this kitchen has all the amenities needed to make your masterpiece. The custom vented hood is large and makes a statement, while the white subway tile blends in to it's surroundings - letting other features in the kitchen pop! Cabinets to the ceiling offer plenty of storage as well as the pantry to the right of the fridge. Comfortable, chic, art deco - 3 "words" we'd use to describe this space. Wainscoted walls add elegance, while the large rustic table brings comfort. The cove ceiling with crown molding creates a separate space for this casual dining area from the rest of the kitchen. 3 large black Andersen windows offer lots of light and really bring the outdoors in. It’s that time of year again and we are so excited to share our Model Home with you! 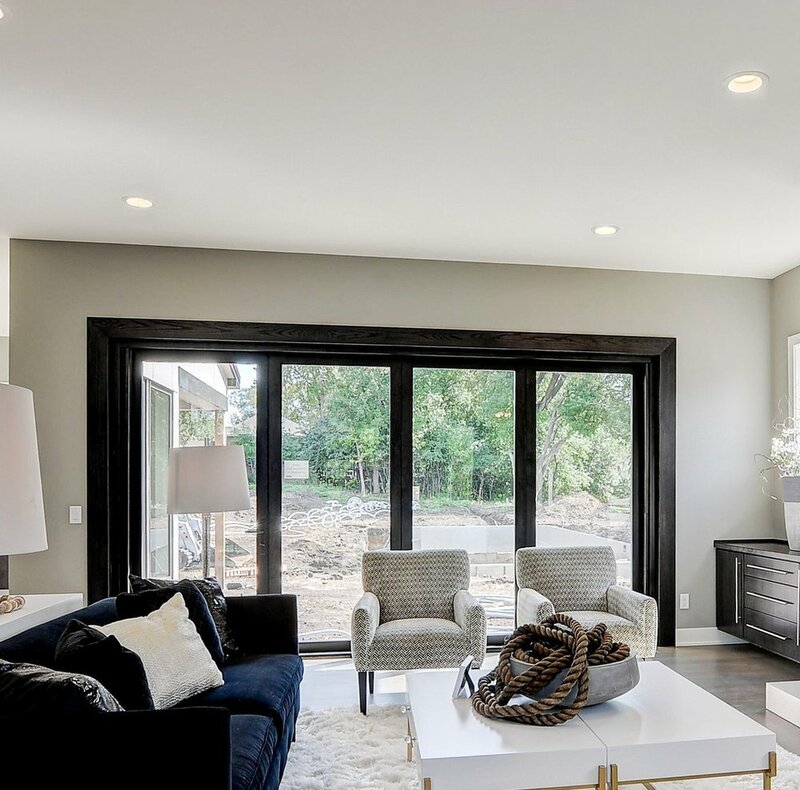 This completely custom home is located on a beautiful .7 acre lot in our newest development, Linner Road Estates - just minutes from downtown Wayzata, and less than 15 minutes from downtown Minneapolis. 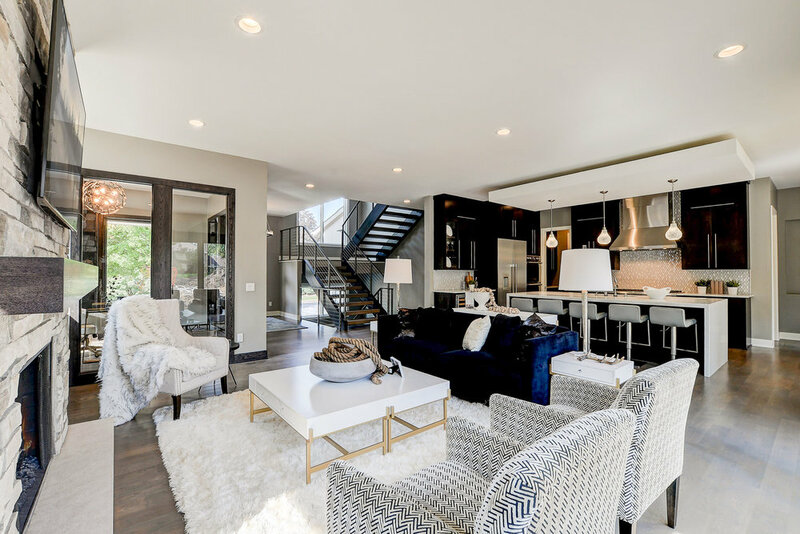 This contemporary design has high-end finishes and designer details around every corner. 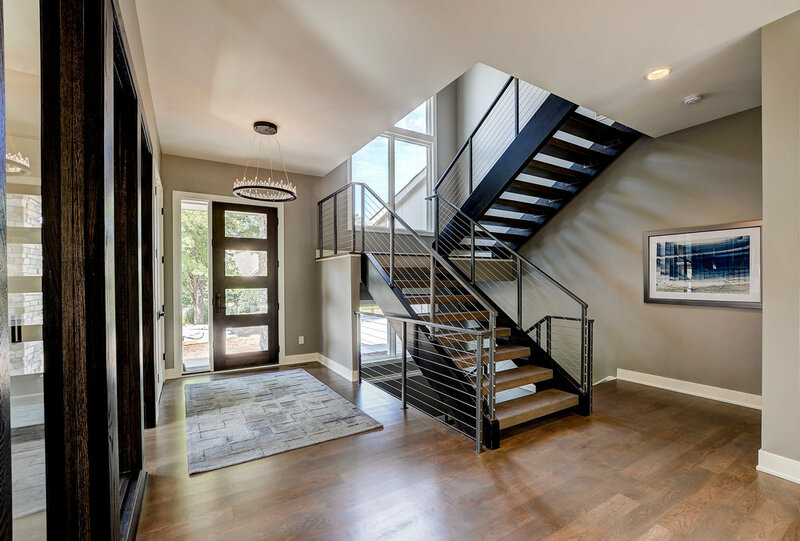 Centor folding patio door, custom-designed study, floating stairs and luxurious kitchen are just a few of the highlights. The Parade of Homes runs through Sunday, September 30th, and the hours are Thursdays - Sundays from 12-6pm. We look forward to seeing you there! 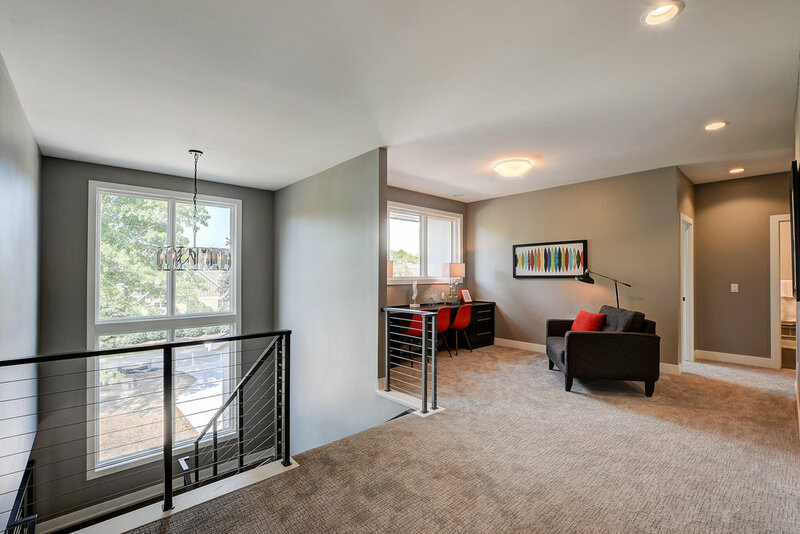 This Lower Level Rec/Family Room is perfect for entertaining! It features a ping pong table, stone fireplace, reclaimed barn wood, barn doors, bar, and more! Cozy on up to the fireplace to enjoy your favorite movie or sporting event! This fireplace features stone to the ceiling & a reclaimed barnwood mantle. Custom built ins frame the fireplace & offer plenty of storage! Whether you're super competitive or just want to play a good 'ole friendly game -this spot is perfect for you! The barn doors on the wall help bring the rustic touch to this area of the large space. This Wet Bar is the perfect place to belly up to enjoy a cold brew! It has walkout access to the patio, which makes it perfect for entertaining - inside or out! 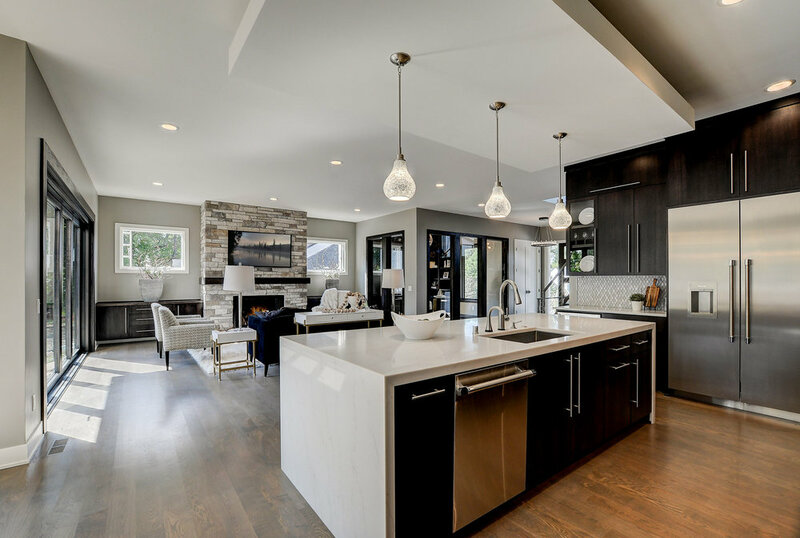 It features a stone mosaic backsplash, granite countertops, and pendant lighting - to give you that "real" bar feel! It opens up to the rest of the Rec Room, making entertaining a breeze! What is your favorite part of this Lower Level Rec/Family Room? If you are looking for ways to refresh your style, there are a lot of fun ways to liven up a room . Adding accent colors and patterns can really make a room stand out. A few ways to add color and patterns to a room are by adding bright colored accent pieces. A few bright accent pieces can add a lot of color to a room. Throw pillows are a fun way to brighten up a room, for any season! You don't always have to paint the walls to add color to a room...Instead paint the cabinets! Colored furniture can make a bold statement. Wallpaper in a small space is really eye catching. Area rugs & accessories are a fan favorite to add color to a space. Furniture with patterns are a great way to liven up a room. Where is your favorite place to add a pop of color in your home? Picture your dream Owner's Suite...Would it have a large shower, soaking tub, heated floors, and plenty of storage? We thought so. The Owner's Suite at our Fox Street Model is truly a dream come true! You walk into the Owner's Suite through double doors. To the left is the bedroom, to the right is the private bathroom. The bedroom is spacious and the large windows offer great light! The cozy sitting area features built-in book cases & recessed can lighting. Who wouldn't want to curl up and read a book here? This Owner's Suite Bathroom is a showstopper! Marble floors & countertops add an elegant feel to this luxurious bathroom. This room is bright & airy while offering all the amenities you need to start or end your day. Enameled white cabinetry features practical storage as well as display shelves. Chrome fixtures add a little "bling" to an already stunning bathroom. 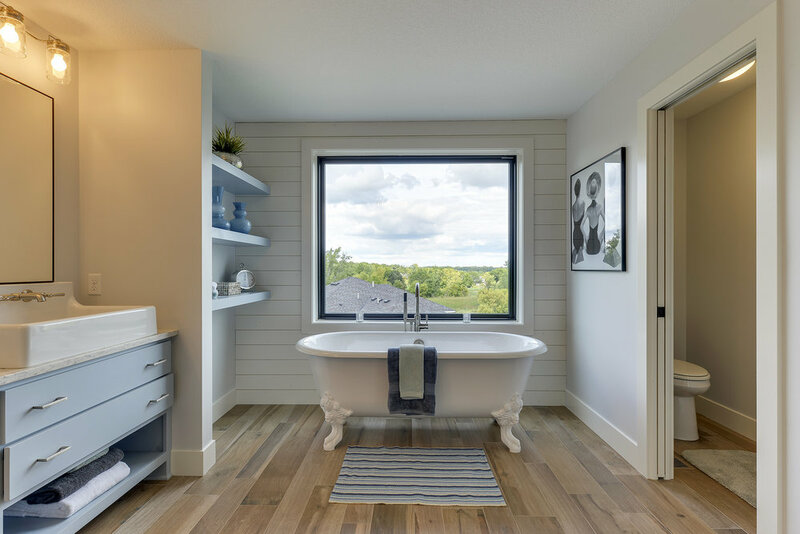 Let the heated floor warm your toes as you hop into the freestanding soaking tub. The closet is spacious, yet practical. Plenty of room for hanging as well as drawers and shoe shelves! The best part of this closet is that it has a pocket door leading to the laundry room. Talk about convenience! What is your favorite part of this beautiful Owner's Suite? Rustic Farmhouse meets Modern Day conveniences. This beautiful kitchen was so much fun to design with our clients. Now, we'd like to share more of the details of this comfortable yet stylish space with you! This center island is perfect for a busy family or entertaining guests! It's soft blue/gray enamel brings a pop of color without being too overwhelming. The island was designed to have the stools tuck under, creating a seamless look. The end panels offer a cross detail - which we love. 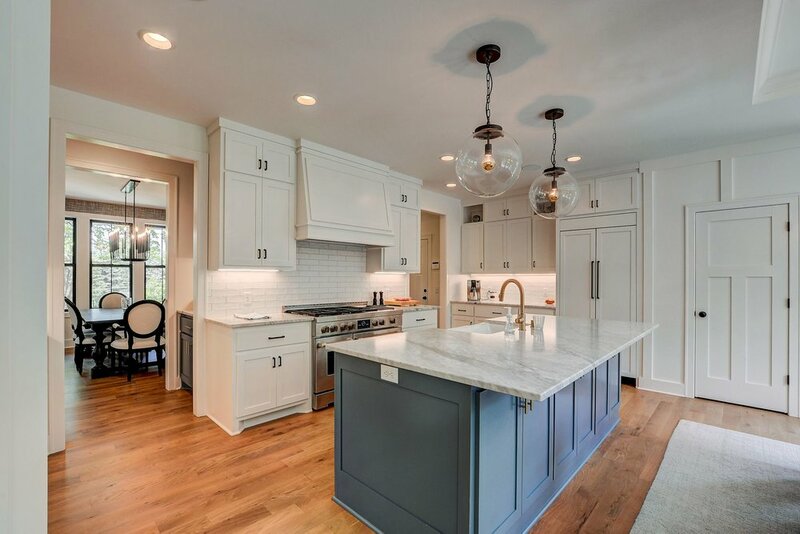 The warmth of the butcher block countertop makes the space feel comfortable & casual. This island houses the farmhouse sink, dishwasher, & microwave drawer. A farmhouse sink wouldn't be complete without a beautifully classic faucet. These cabinets provide function & style! Shaker style cabinetry frames a beautiful custom wood hood. A large slide in range is made for a gourmet chef! Lighted glass upper cabinets offer a space for displaying decor & bring a touch a elegance to a casual space. Hiding in the perimeter cabinetry is a secret entryway - you heard me right! Open the pantry doors to reveal an oversized walk-in pantry! The perfect place to hydrate or grab a snack! This beverage station features a custom-paneled beverage fridge, floating wood shelves, and beautiful subway tile to the ceiling! We love the contrast of the floating wood shelves against the white cabinets. These shelves also help to tie in the butcher block island countertop perfectly! This kitchen truly just makes us feel at home. It is so inviting, warm, & comfortable! What is your favorite part of this room?